This is a short series of articles that will help you break down and understand how 8-ways are built. 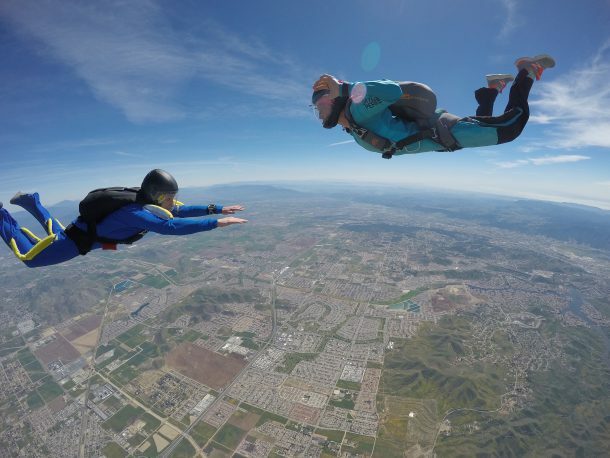 While we are focusing on the formations in the competition pool, the skills and tools shown here are highly transferable to general formation skydiving. 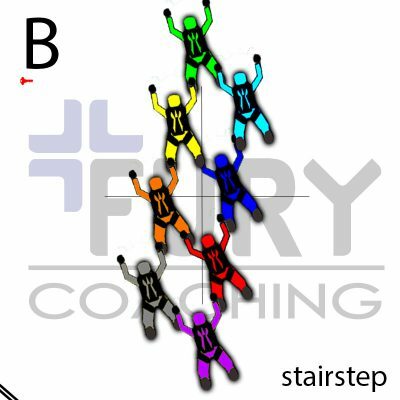 As you begin to decode 8-way formations, it is helpful to understand that each person has a particular slot on the team that indicates what position they are in each formation. This is the same principle as 4-way slots. 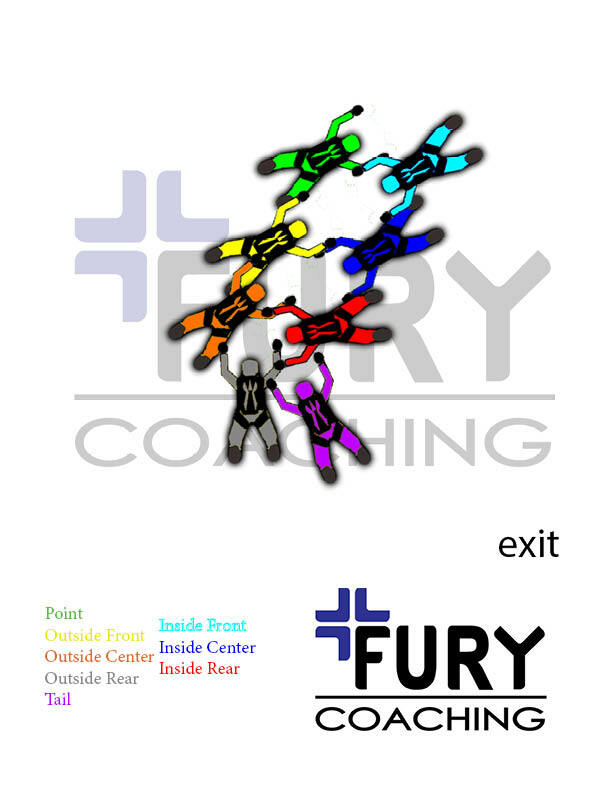 These assigned positions within a formation are not actual rules, but clever guidelines designed to help build efficiency and repetition for practicing teams. Unlike 4-way, there are loads of different naming conventions for 8-way slots*. I am going to introduce you to my preferred terminology so that things stay consistent at least within these articles. Most of the slots are based on and named after the standard 8way exit. This does not mean you need to exit a whole chunk to do some awesome 8way! I am simply introducing the exit here to help you understand where some of the names derive from, and where everyone is in relation to each other. In a later article, I will cover more detail about the exit for those looking forward to that challenge. Now for the fun part. 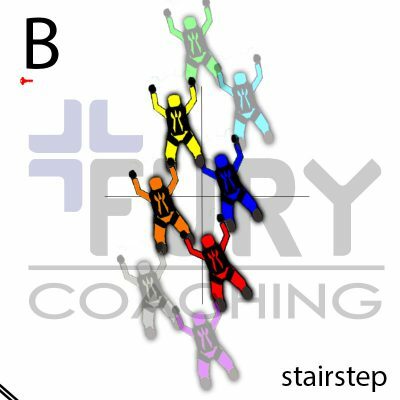 Let’s look at a typical 8-way formation and identify the slots. This formation is a Stairstep. Notice is that everyone is facing the same direction. Just like in 4-way, formations often have a way they dominantly face. The front of this group is the Point (green), the back is the Tail (purple). The final two pieces are the Inside Front (Cyan) and the Outside Rear (gray). They derive their names from where they exit an Otter. The Inside Front is in the inside of a plane towards the front. The Outside Rear is outside the plane towards the rear.If you look closely at the formation, you can see there is a 4-way Diamond in the middle of it. The middle is the Outside Front (yellow), Outside Center (orange), Inside Rear (red), and Inside Center (blue). These four slots are considered the center four. With these basics in mind, you can start looking at any 4-way formation and making guesses at who might be in that slot. * My other favorite naming convention is the snow white and the seven dorks: Sinky, Spacey, Nutsy, Geeky, Goofy, Floaty, and Joe. Get the No-Go-Low Tunnel Drill Guide! Download the tunnel drill cheat sheet for mastering fall rate. The cheat sheet is on it's way! You may need to confirm your email before it comes to you.